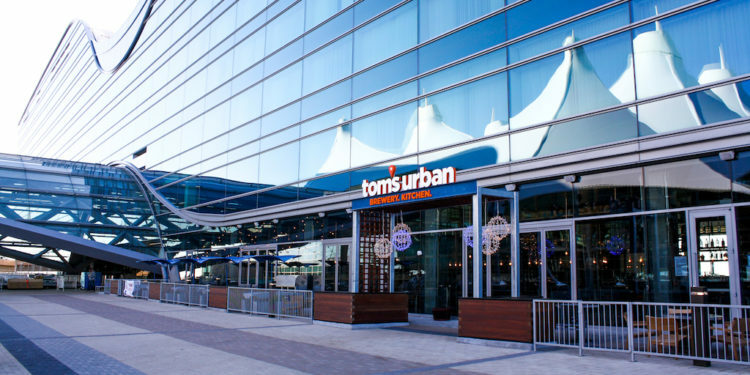 DENVER – White Construction Group recently completed the new Tom’s Urban Kitchen and Brewery at The Westin Denver International Airport (DEN) for Midfield Concession Enterprises, Inc.
Tom’s Urban Kitchen and Brewery, designed by JGA Architects is the first complete brewing operation at DEN, complete with a viewing window to observe the process and a beer tower with 32 taps. 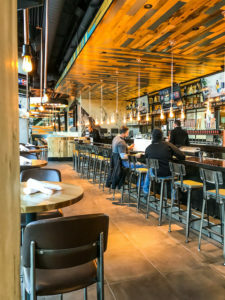 The dynamic restaurant tenant finish includes local beetle kill floating ceilings and benches, unique industrial light fixtures, metal fabrications, 40 TV’s and authentic art throughout. Ample outdoor seating is available on the new terrace with fire pits, custom planters, string lighting and views of the Rocky Mountains and of the kinetic “Field of Air” sculpture. 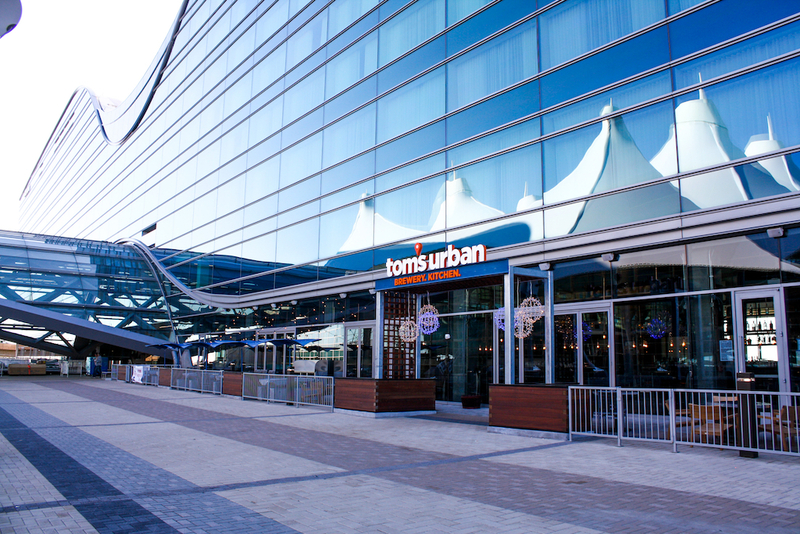 Tom’s Urban Kitchen and Brewery pairs the unique cuisine of Tom’s Urban with the celebrated craft beers of Tivoli Brewery, bringing together two celebrated Colorado brands to give visitors a taste of local flavor. Tivoli takes pride in the art of brewing and developing the finest quality beer, carefully crafted over 42 days. A historic brewery with 150 years of business in Colorado, Tivoli’s deep local roots made them an ideal fit for an on-site brewery partner for Tom’s Urban. Midfield Concession Enterprises is an award-winning and premier food and beverage service operator delivering world-class quality food, management and customer service to airplane travelers across the country. MCE has 50+ restaurants located in 10 of the nation’s top airports. As an innovative, built-environment partner, White Construction Group has specialized in community-focused, commercial construction, design-build, and adaptive re-use projects in the Rocky Mountain region for more than 33 years.